I listened, stunned and speechless as I learned that Michael’s arteries were so badly blocked, he should not be living. That our dream trip of hiking in Newfoundland was a blessing and a miracle. The day we hiked up 497 steps should have killed him. But we never knew and the view was spectacular. We were truly clueless- we walk all the time and thought the only thing next week was bringing was a hernia operation. And for that everything was medically cleared. Thank the Lord for that Tuesday of shortness of breath, legs that felt like concrete and chest pressure. Thank the Lord the ambulance came. Medications and equipment and decisions, potential outcomes, and side effects were pushing and shoving us around, all demanding attention. And it seemed like at any moment we could just get trampled. But we were shepherded. Thank the Lord for the phenomenally gifted cardiologists. Yes, they were doing their job, but, thank the Lord that there was this one little enzyme reading in his blood that seemed oddly out of sync. The one they decided to keep monitoring. Because that one little enzyme reading meant that maybe sending us home for an outpatient stress test was not the best option-it could have been fatal. Thank the Lord there was no outpatient hernia surgery where some poor surgeon would have had an inexplicable fatality. Thank the Lord! I am not thankful that any of this happened, and not thankful that my husband has now had not just big surgery, but gigantic surgery- 5 bypasses! I am not thankful for coronary artery disease or his family’s history of it. In the life of people, the psalms take turns praising and lamenting while proclaiming that even in the midst of what seemed almost insurmountable, there was God, providing. It’s a praise that doesn’t depend on “no bad things happen.” It speaks of thanksgiving knowing bad things do happen but God is there with us in it as generations gather around. God provided when my colleagues met me and called me, and enveloped us in prayer and presence. Because I am an only child whose whole family lives elsewhere and I could very easily have sat for hours and days alone. Not so- because God moved in and through them. When one of my colleagues asked how she could help me, words I never imagined in my independent mind spilled forth- “I need you to be my pastor.” And she came- she visited, she prayed, and then she came the day of surgery in the early hours, and prayed and blessed, and sat all day. She had cleared her whole day to be wherever we needed her to be. Steadfast. Enduring. Love. We were in God’s hand and shepherded. Even though my phone was “blowing up,” this onslaught of care and love that God ushered forth was greater than everything Michael and I were facing. Who would have thought that the digital age could offer this new vision of steadfast and enduring love? While we were staring into scary places- bigger than that was God-never absent. There was a quiet power there but it was powerful indeed. That hand too showed powerful, steadfast love. From now on when I read that God’s steadfast love endures forever, I will have a permanent image seared into my memory and on my heart. And I share these words for other people whose lives face fear and loss, There in the midst, was a profound unimaginable loving presence-God’s unbounded love looked loss head-on and transported us through it. And all I can do is to come and praise God and tell you about it. Tell the good news! In the end, this is what God longs for- that we connect with this profound love, receive it, dwell in it, and share it. That’s what the psalm does- it helps those who are grateful celebrate and those who are not, feel it’s possible. I’ve told my story of God, not yours. But each of us, I hope and pray has a story somewhere of God’s love and power to share. Sometimes it's hard to say Christ is powerful when we can barely muster words. We don’t have to feel powerful to give God power. Instead we’re simply encouraged to take turns telling of those moments of steadfast enduring love, and living those moments where God is with us in God’s pasture together. And God can work through us with each other, being Christ for each other, loving, providing, shepherding, blessing. Giving and receiving. Last night I shared with our congregation council news that I had accepted another call and would be ending our time together at Holy Spirit to begin a new call at Christ Lutheran in Conyngham, PA. Below is the letter that I shared with them and which has been mailed out to our members. I ask for your prayers for both congregations and for our family as we move into this new and very exciting time. While I am sad to leave great connections here in Centre Park and in the congregation, our family is also energized by the enthusiasm and joyful spirit of the folks in Conyngham who have embraced us so lovingly. In 2011, you took a chance on an untested Pastor straight out of seminary. In the years that followed we have shared much together, our joys and sorrows, hopes and fears. I thank God for each of your and for our time together as you have helped me grow. We have celebrated joys, mourned sorrows, and served the gospel together in worship, in fellowship, in our outreach efforts and the very vital afterschool ministry, The Dove’s Nest. You have taught me much and have blessed me by sharing life together. I firmly believe that the quality worship and vital community ministry and outreach must continue and I recognized that to take the long view required evaluating how that might be best accomplished. 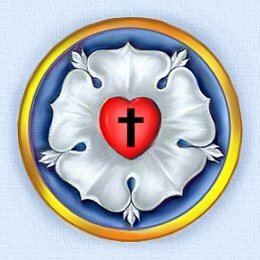 It is with a mix of joy and sadness that I write to share news that I have accepted another call to serve as Pastor of Christ Lutheran Church, in Conyngham, PA. This has not been an easy decision. Michael and I have been praying and discerning for some time both about the future of Holy Spirit, and our future as well. As we look at the needs of our family and for this congregation, it seemed that it is the right time and right opportunity to relocate. We believe Christ Lutheran is a great fit for the continued development of my gifts and strengths in ministry and offers community and connections for Michael as well. At the same time we pray this transition offers Holy Spirit greater ability to explore and continue in vital partnerships and ministries here. With my departure my pastoral relationship with the members of Holy Spirit will come to an end. I treasure the privilege you have given me to serve as your pastor, but upon my departure, those responsibilities will belong to your interim and future leaders. While friendships may continue, it will no longer be appropriate for me to perform pastoral functions within the congregation or for its members. Therefore, however hard it may be, if you ask, I will say No. This is because I have great respect for the integrity of the congregation and for the ministry of those who will serve you, as well as great love for the church. Sometimes the greatest challenge is to act with ethics rather than emotion but it is necessary for the health of the congregation. For these reasons, I shall decline invitations to preside or assist at weddings, baptisms, funerals or other congregational functions without the approval of the congregation council and bishop. My hope and request is that you as my former parishioners and future friends help me keep a healthy distance from the congregation. On the other hand, I would be honored to be invited as your friend to attend such events. My last Sunday leading worship as the Pastor of Holy Spirit will be December 28th. Michael, the girls and I then leave for Finland utilizing the last of my unused vacation. My last day of service will be January 10, 2015 as we move and I begin my new call on January 11, 2015. It is my hope and prayer that we can share in meaningful celebrations at God’s table, and in heartfelt farewells. In these weeks, I will be visiting our homebound and also putting things in order for the smoothest transition for you. It is also my hope and prayer that as we each respond to God’s call to new journeys that new conversation and opportunities will reveal God’s power and hope and guidance for you. How Full is Your Lamp? Just before worship started, I was talking with someone about the modern understanding of the word, “Gospel.” Oftentimes today it is interpreted as “good news” and it is, and yet that good news is seen as being words that affirm and uplift us and tell us we’re ok. Yet sometimes, the other function of the gospel is to speak truth- a truth perhaps we need to hear, spoken in love but not comforting. If you came to church today expecting warmth and comfort from the lessons- Sorry. This past Wednesday I asked the folks at Table Church to sit and wait for a minute. I’d like us to do that as well. You all did pretty well, but the truth is many of us don’t like to wait. Including your pastor who as you noticed checked her watch pretty often. On Wednesday, about halfway through many were starting to fidget, and at the end of the minute a couple kids commented on how hard waiting is, especially without Xbox or something. And I suspect a couple adults were wondering what would happen to that hot food if the pastor was going to make us wait. That minute felt long. Waiting can be hard. "What will we do while we wait?” is the question Matthew’s gospel is addressing today. We’re waiting for Jesus to return- much longer than Matthew's original hearers. SO what should we learn today? HAVE ENOUGH OIL. While that seems like something to do, I want to suggest that it is not just about cornering the market on something. The oil is not the kind we watch the news to see if prices are up or down. Literally it’s Olive oil. Perhaps you hadn’t thought this but, literally, the answer to, "What shall we do while we wait?" is "Make sure you have enough oil for your lamps." In an age of electricity, where we no longer need to put oil in lamps, what can that mean? The five foolish bridesmaids ran out of it and the five wise ones had enough to go the distance. But what does the oil represent? Martin Luther thought it represented faith- don’t run out of faith. I don’t agree with Luther. Because Faith comes from God- can you run out of faith if God is the provider? Others think that the oil represents good works. Don’t stop doing good works. But then what of grace? Imagine the frenzy of last minute good deeds- that seems to suggest if we do enough, we earn it. I’m not sure good works is quite right. Which speaks a word to lots of people today focused upon community service, especially young adults. Good works are good-and we all could use all we can get. At the same time, when the project is done, what is beyond it? What is the sustaining presence for all the other moments? The ones without projects? Still someone else suggested the oil seems to be a generic reference to faithful and obedient discipleship as defined by the whole gospel. To be like the slave who elsewhere actively, faithfully, and obediently carries out what he has been instructed to do. It’s about trust. But where do we buy more trust? Obviously there is something to being active in waiting, and in trusting, but maybe it’s not about doing those things as much as its about not running out of the power to do them. * We who are told to tend the light are also told to go and be light for the world. We need a power that produces good deeds- the power needed to produce light. Maybe this parable is using "oil" to be our relationship with God, who is the source and power behind our good deeds and our trusting. And then maybe we can ask- how full is our lamp? Perhaps some of us are burning brightly this day, or perhaps some of us are sputtering out. But one thing is sure- the lamp needs to be tended. Like any relationship. Our relationship with God requires our attention. To borrow yet another relationship phrase- does your relationship with God have a spark? If you walked into Jesus would you feel like you know each other? Or would you sense only a faintly distant connection? When our girls were little they only saw my parents at holidays and the rest of the year we faced the challenge of helping them remember who these people who were so eager to see them and bring gifts were. We’d talk about how their grandparents were coming. We’d get the house ready for them. But it took other ways of being in touch while we were waiting to keep their relationship current. Phone calls, pictures, videos, telling those distant relatives what they’ve been doing. Even though those deeds weren’t the basis of the relationship, they were part of letting the grandparents know who their grandkids are and vice versa. To a certain degree as parents we mediated the relationship until it was strong on its own. “If we understand "oil" as having a close relationship with God -- the power behind our lives -- the power that gives us a "glow" as shining witnesses in the world -- we must acknowledge that it is possible to let that relationship "run out". When the bridegroom comes, it (seems) too late to try and establish the relationship.” And in that context when we hear that those frenzied bridesmaids came back they found the door closed perhaps it’s important to note that although the door was closed, we don’t hear who closed it. We just know it was closed. God gives us a relationship and faith and while God never closes the door, we can. And while our salvation is assured, we can in this life lose the power and strength we need and long for in this life. Our relationship with Jesus – being known by Jesus- can’t be mediated through other people who have it. I can’t do that for Jane, for example, nor she for me. This is why the other bridesmaids cannot share their oil. Our relationship with God needs us to keep glowing. And as we hear in Amos, it’s about more than just going through the motions of worship an hour a week. It’s a relationship- God longs for and indeed kindles the spark of our faith for much more. Our deeds then are a response and even help fan the flame, but our works are not the relationship. Being disciples in this way with God means we are tending that relationship and doing what God desires in an ongoing way. It doesn’t mean we cannot rest- after all , all the bridesmaids rested. But it does mean constantly tending our relationship with God so it has the power and meaning and support we need to avoid panic and chaos. God wants to have a personal relationship- one where we share our hopes and fears, and where God invites us to share in a meal that reminds each of us- this is “for you.” And the door is open. God is always striving to establish that personal relationship. One where today matters not just someday- for us and for the world. While we wait we can know the power of encountering Jesus, entering now, inviting us in to participate and celebrate the many comings of the Christ: Jesus' presence in the Word; in the Sacrament; in the gathering together; in our going out to make disciples; as we minister to the "least of these." This is what we are given to do and to experience. And it’s a lot. As we gather once again on this All Saints Sunday, we see the light of these candles and it reminds us of saints not only from this congregation but who have touched our lives. Those God has given us across time. They are on our minds today. Perhaps today more than ever we sense that presence of the communion of the saints. Today we hear words from Revelation, this last book in Scripture intended to be words of hope. At every funeral I preside over I read words from the book of Revelation and say that they are intended to be words of hope and at least half of the faces crinkle up like that is a strange statement. So many are caught up in things like imagining Armageddon, and the Rapture and who’s left behind and who will be in hell. But what we are really given is saints around the throne of God whose struggles are no more. Tears are wiped away and we’re drawn to God. 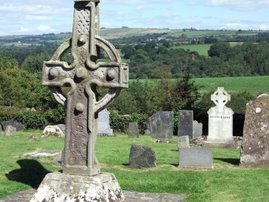 The Celtic people in Ireland speak of “thin places”- places where worlds come together- the world here and the world beyond. The barriers we normally experience are not there. There are sacred spaces where you can get that sense. There are also events that function that way and for me All Saint’s Sunday feels like that. Being drawn close to God and a longing to be together when all the struggles are done and all the tears are wiped away. And there’s a moment- that’s communion of the saints. Perhaps you experience it this day as well. I think that’s what we experience at funerals- the thin place where people come who haven’t been here in a while, drawn closer not only by a life lived for which we give thanks to God, but often a time where people speak of a closer sense of God and what the church means- at least for a moment. We forget the things in life our loved one did that weren’t the best- they fall away and we remember the good of people and community. If only those thin places could stay thin and continue to be communion of the saints. Yesterday I attended the funeral of a colleague, Sadie, who fought the good fight with cancer and we celebrated her life’s work, in particular, her commitment to criminal justice system ministry. Something I know some of you are connected to in different ways. Most recently she worked as a chaplain at a state correctional facility in Camp Hill where she labored tirelessly. But a mentor said she once called him with a question, in the midst of her labors, she aske- “why did some people respond to God and to help and others did not?" Her mentor suggested that maybe some people are just broken beyond the point of being helped- their souls are just too broken. And at this point Sadie just laughed at him and said,” Why on earth would God give anyone a permanently broken soul? !” Why indeed. And for her this was, I believe, the vision of communion with God and the saints- a place much broader than our vision. A place where the thin place stayed thin. That’s what Revelation points to this day. That’s what we say each week in our Creed- that the vision John speaks of is so different. The multitude around the throne- different languages, and races and lives lived- all there. And it’s so captivating he doesn’t even stop to wonder- why are THOSE people there? He’s in awe of what God is doing, calling us all children of God with a place. It’s not about us and “our” beloved- it’s about God who God loves. And the number continues to grow and grow and the communion gets ever larger because there are no permanently broken souls beyond help-truly. Communion of the saints means we are given this privilege by God. And we are given a purpose. 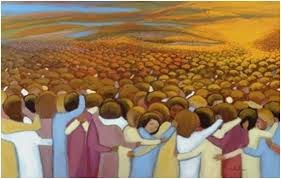 We are given this vision and we are given words of faith that include saying we believe in this communion of the saints. The words we say in our Creed- our statement of faith. After speaking of God our Creator, and Christ our Redeemer, and the power and work of the Spirit, we say more. That we believe the church is holy- may it be holy when we are here. We say is it catholic- which is a way of saying united and we say we believe in the communion of the saints. That we are in communion with God in Christ and with the saints who have died and for whom God’s promises are made known. And we are in communion here and now-we are each of us, saints. Sinners to be sure, but also saints claimed as God’s children in our baptism. Given communion- a community, and a promise and a purpose. This too is communion of the saints. Which is why it makes complete sense that after the funeral of a saint committed to criminal justice ministry, I was meeting with a family whose lives are in another part of the system as their son works and indeed labors to make changes and to be reunited with his loved ones. I asked him what keeps him focused and helps his work and he of course mentioned his family. But the first word was “God.” And he shared with me that he keeps a tiny Bible in his pocket because it reminds him that God is always with him. And he thinks of his family and of this church. And then he shared the work of one of our saints here who, on her own had asked for his address and without waiting to be asked or seeing if anyone else was doing so, sent him a card and a care package. He was in awe, and I was too. He received a card of encouragement and support and candy that he could share. Candy that helped him make friends with other boys there- and I imagine them all around that box sharing- and while some might look at them and see a group of sinners- God saw communion of the saints. The gathering of those in this life around God and community is what we are given now to give us hope. Because in this life we labor and struggle, all of us. But God in Christ Jesus gives us communion and community- may it be what we sense each time we are here. Until that day when the thin places stay thin. We’re given these things so we too can be in awe of what God is doing right now and to not rest until everyone knows it.